Cream condensed milk,butter,elachi powder , add semolina, almonds and klim ,then add sifted self raising flour and ,form a soft dough. Roll into jumun shapes. 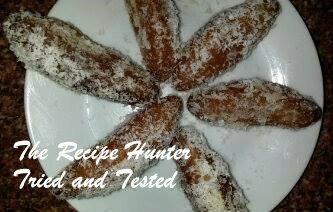 Deep Fry on medium heat until they rise and are golden brown in colour Dip in cold syrup ,roll in coconut. To make the syrup: add the sugar, water and rose essence to a small pot and bring to boil, then allow to simmer on very low heat. A thin syrup is required.